CG11, Militant, redmc and 1 others like this. Interesting article. I have encountered open carrying folks in Arizona recently; they are not rare but there are some. Being Arizona, no on paid them any mind that I noticed. Still, I don't think I will ever open carry in public. I just don't believe in giving the bad guy a heads up. Mike1956 and Rockymonster like this. Four encounters with cops, a couple of them ready to do violence because they knew a civilian had a gun, and none would have happened if carrying concealed. Seems like open carry added a fair amount of risk to the carrying equation, and for what? A chance to education the public? I’m not putting my life on the line simply to be a gun evangelist. The whole reason to carry is to mitigate risk, not increase it. Wavygravy, graydude, ShooterGranny and 5 others like this. I open carried years back when I used to trek and backwoods camp in Sate and National Forests in PA. I did it for two reasons. First, pocket or IWB carry would be uncomfortable while hiking, climbing, etc. Second, I wanted to be certain that, if I ever needed the gun for protection, the belt of the backpack and the waist pacinI added would not impede access to it. I ruled out open carry at other times because I think that it is a fear magnet they simply invites frightened people to call the police. I also think that there are numerous people who fear the sight of a gun in public, or who think that is you carry a gun you must have ill intentions. So open carrying would only call unwanted attention to me. I do believe that open carrying will deter any BG who might be looking for a victim to prey upon, so not doing it probably increases risk little bit. I can live with that. But to decrease that risk a bit whenever I can I carry OWB with a shirt of coat cloaking the gun. I do that because I think OWB is more comfortable than IWB, and the gun stays out of sight but still very accessible. Sometimes someone gets a peak at it I’d the shirt blow a open when not buttoned. Sometimes the gun is visible when I pull the coat back to reach into a pants pocket. I can live with that too. What I would not want to live with is exchanges with LEOs about my carrying a gun. In this part of North Carolina I've witnessed open carry on occasion. Some individuals notice and others don't, but there was the lady from Ohio that screamed he has a gun thus Wendy's almost emptied out until a command voice said "Open carry is legal in NC". I myself don't practice open carry even on my own property but others do. Each to their own applies. To date I've only witnessed one lady open carrying while shopping at Walmart. Bikenut, Mike1956, Rockymonster and 1 others like this. I saw some contractors OC'ing at a La Quinta we were staying at in NC a few years ago. I hardly ever see it around here. As I have said here before I open carry on occasion. I don't like it much in town but, I do camping, hiking and such. I do wear it from leaving the house until we get home though which means pumping gas or going into a store or cafe on the road. Its no big thing here and I tried open carry in town here a few times and interesting thing is most people that talk to me about it are foreign tourists who I think find it fascinating and a "western" thing like in a movie. I do only open carry a revolver in nice leather which gives a different optic here than a Glock in a drop leg setup although we see that here as well especially when town fills with bikers from all over. We have a bike week here that catches the masses on their way to Sturgis every summer. Lots of open carry then. Once when having breakfast at a cafe in Cody,Wyoming with some friends from the UK he leaned over and asked me if I noticed how many people were openly wearing handguns. There were only 6 that I saw not including me and the place was full. They have been vacationing in Wyoming for so many years they don't think much about it anymore and they are from the UK. Think about that, the UK! AzQkr, Rockymonster, OD* and 1 others like this. I never open carried [ due to the law ] until I moved to Az. Not one instance while open carrying, either being called on or from leo's who've wandered by and seen the open carrying. It's no big deal to open carry here, with the exception of SOME areas of major cities like Tuscon, Phx. which I do not frequent but hear others speak to. Common sense is a must for when and where, of course. As for giving BG's advanced notice, as if they get some advantage over me when I open carry? Please, the advantage is mine, not there's. They have the advantage of deciding I'm not an easy target, I get the advantage of warding off any ill intent while they look elsewhere for an easier potential vic. Standing in a line at a convenience store with people in close proximity? Elbow on gun, or arm draped so no one can attempt to take it without my feeling that first, then responding accordingly. Open carried on the bike today, stopped and had breakfast at a nice place in Superior. 20 or so people inside at tables, NOT one person gave myself or the gun a second look. I know cause I took a table with another rider where my back was to a wall and the front door was just to my left. Getting up after ordering and stepping outside where everyone could see it to get something from the bike, reentering where everyone could again see it. The waitresses and cashier never gave the holstered Shield 45 strong side owb a glance. 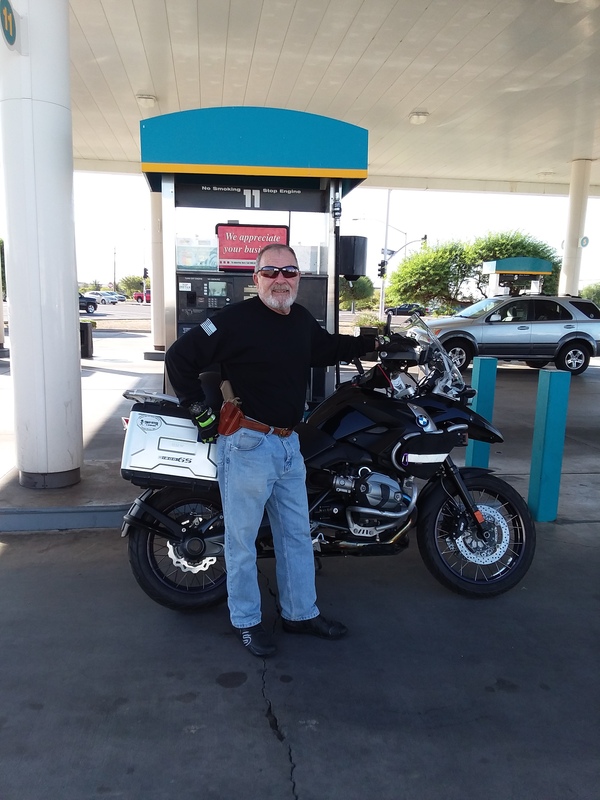 Here's from another day pumping gas coming back from a days ride. Gun clearly visible on my waist, and guess what, no one that day took notice or if they did never gave any indication they were concerned about that 19X nestled into an owb holster. Those who have no experience with open carry, those who have no h2h skills, those who "feel" they are vulnerable to a gun grab while open carrying, keep your guns concealed. ME? I'll move in and out of open/concealed carry as the mood strikes me based on temps, planned locations I'll be visiting and never give MY open carried firearm a second thought. Oh ya, one more thing, the time it takes to draw and put the first round into some turd who just has to be a threat? .60 seconds. Can you get to YOUR gun and fire in that time from concealed? I can't. From concealed that .60 increases to .90-1.00 second. The time saved could mean the difference between putting 1 in them or putting 3 into them [ .20 splits ]. I'll take the 3 over the 1 in under a second all day long. YMMV, based on your own training, or lack thereof. There's several people on this site who KNOW what speed and accuracy I possess and what I'm capable of with a firearm due to extensive training over decades. I suggest if you'd think of taking it from me, think again, the life you save WILL be your own. Bikenut, Mike1956, forester58 and 1 others like this. I've open carried into a local Walmart at all hours of the day, including 3am. NO one has ever given a crap nor makes any type of comment about the visible gun on my hip. Sometimes I'll be open carrying and untuck the shirt to conceal carry. Other times I'm concealing and based on something I've seen, I'll move the shirt to behind the holster so it's visible. Just the other day I was working the gun shop counter and this nefarious looking tweeker type walked in. His demeanor didn't give me a warm and fuzzy, and I tucked the shirt in behind the gun while talking to him at the counter. He didn't stay long afterward, kinda obvious he might have been considering being stupid, his demeanor changed at the sight of the holstered handgun, made some excuse he was late to meet someone and boogied out and away. Mike1956 and Bikenut like this. Thanks for posting that article about open carry Mike1956. And people don't want to open carry where legal because they don't want the bad guy to see they have a gun? Well one of those "bad guys" are the anti gunners who want guns to be some kind of dirty little secret because they know that if everyday folks see a gun in public and notice that nothing happens their fear mongering arguments are blown out the window. And, at least in my opinion, hiding the right to bear arms is one of the reasons why we are losing! I've been open carrying every day everywhere it is legal here in Michigan for 10 or so years. And because of the way Michigan law reads open carry does not need a permit however open carry with a concealed carry permit is legal in some places where concealed carry is not. I've open carried in some of those places too. I've open carried at my township council meetings. They didn't like it much but after a while they got used to it. I've even managed to convince a very stanch liberal friend to not only get a carry permit but to also open carry. I've had every kind of reaction from compliments to questions about legality to police interactions both polite and not so polite. Even had one officer try to get me to say something, anything, he could use to arrest me in the men's room of a Wendy's in Mason Mi. while I was standing at the urinal holding on and taking care of business. He gave up before I decided if I wanted to turn and face him irrigating his shoes. I've been asked to leave 3 different businesses and I did so immediately letting those managers know I would put the incident on social media. And I've had businesses welcome me with open arms saying they felt safer while I was there. But I do not hide my right to bear arms because I most definitely am not ashamed or afraid to exercise it. AzQkr, Mike1956, ShooterGranny and 2 others like this. I usually conceal carry in the liberal bastions of Oregon and open carry in conservative areas. Never had an issue so far. forester58, Mike1956 and AzQkr like this. As they go after the Constitution ever more blatantly it does make me want to open carry more even though its pretty common here. I should be more of a contributor to that commonality. Like our English friends say "its just a normal thing here". My wife prefers I open carry for that very reason. Funny how two open carriers often just give a nod to each other on the street as if to acknowledge your willingness to contribute to openly exercising your rights. Bikenut and Mike1956 like this. I met an interesting guy in my Krav Maga class. He is in his 60's, a professor specializing in military history. He is an authority on black powder weapons and the tactics that were used in that era. We were practicing some KM knife defense moves that always wound up with the defender disarming the attacker and then stabbing or slashing the attacker, which I can see might be called for in some situations, but also seemed like it would usually be unnecessary once you have the weapon, and possibly even illegal. Last edited by jmf552; April 14th, 2019 at 09:31 PM. Bikenut, AzQkr, forester58 and 2 others like this. About a decade ago a friend and I did a Pat Rogers 3-day course down in Casa Grande (AZ). The first day we neglected to bring our own lunch, and about 8 of us descended on the local McDonald's for chow, all bristling with OWB holsters, some thigh rigs, and mag pouches on the belt. Being a weekday lunchtime, the place was pretty packed. My buddy was from CT (my former home), and at the time the unwritten rule there was no open carry. He felt a bit conspicuous at first, then realized that not one of us was being eyeballed because we were strapped. I wish the nervous Nellies of the world could drop by and mingle at one of our major matches out here. Last month, my club hosted a stellar event, the Superstition Mountain Mystery 3-Gun. 380 competitors, all walking around for 3 days with holstered sidearms and some serious shotguns and combat rifles. We'd probably have to have a Greyhound bus full of counselors to handle the meltdowns. Oh, need I mention that with a round count of about 500 (so about 200,000 rounds fired), no one got shot? Bikenut, Mike1956, forester58 and 3 others like this.